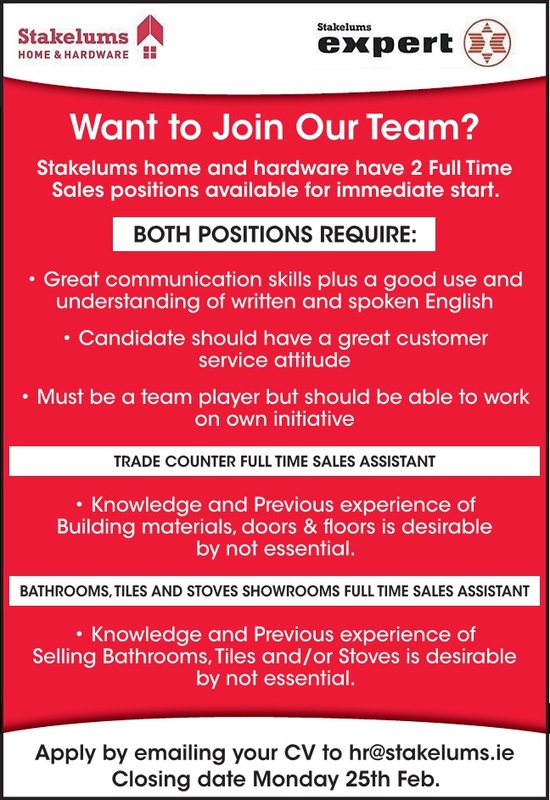 Stakelums Home and Hardware have two full time sales positions available for immediate start. Trade counter full time sales assistant must have knowledge and previous experience of building materials. Doors and floors knowledge is desirable but not essential. Bathrooms, tiles and stoves showrooms full time assistant must have knowledge and previous experience of selling bathrooms, tiles and stoves. Stakelums is a family run DIY business established in Thurles in 1960. We have expertly been servicing the local Tipperary and wider regional communities now for over 50 years. The business has grown successfully in recent times with the addition of a trade electrical department and a trade plumbing department. The growth culminated with the building of an award winning 70,000sq.ft DIY Superstore at Racecourse Retail Park Thurles in 2006. This store is the current home of Stakelums Home & Hardware Business. Stakelums stocks thousands of home and DIY products and all under one roof for your convenience. Stakelums Home & Hardware, Racecourse Retail Park, Racecourse Road, Thurles.